Middle Georgia State University is making it easier than ever for Georgians with a penchant for pilotage to follow their dreams skyward. The University is currently in the middle of a three-year strategic plan to expand its aviation offerings statewide, and the first phase of that plan is well underway at Macon Downtown Airport, where more than 20 students are currently pursuing their degrees in Flight. 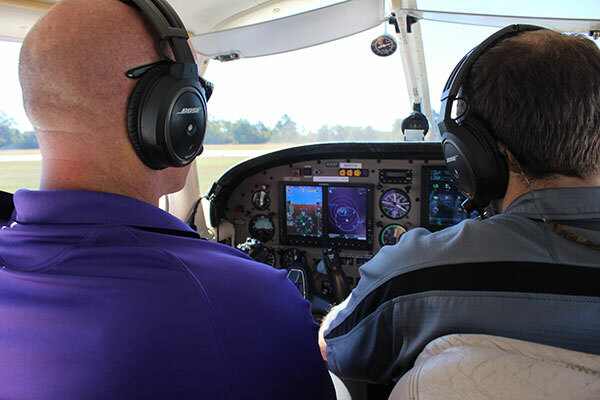 Ground school and flight instruction in Macon started in the summer of 2016, and allows MGA students to pursue the same fixed-wing ratings that have long been available on the Eastman Campus – private, instrument, commercial, multi-engine, and certified flight instructor (CFI). Alex Shakkour steps down from the wing of a purple-and-white Piper Warrior, and grabs the flap – a large control surface that droops down from the training edge of the wing. “I’m checking the flaps now, just making sure that they’re deploying and locking into position.” He walks slowly around the plane, checking and double-checking every control surface, every light, every moving part. A tank truck emblazoned with a Phillips 66 logo pulls up in front of the Warrior, and MGA Assistant Chief Flight Instructor Chad Fischer steps onto the tarmac, and begins explaining the operations of the fuel truck to another MGA student. Fischer unreels a hose and begins to pump gasoline into the plane’s wing – in addition to flight training, MGA is now the airport’s Fixed Base Operator (FBO), responsible for selling fuel to aircraft based at the airport and to transient flyers who visit Macon or stop in en route to other locations. As the fuel flows, Fischer talks about FBO operations. “We’ve increased fuel sales every month since we took over. We sold about 4,000 gallons in September.” About a third of the airport’s fuel sales actually go to MGA students taking one of the University’s fleet of Pipers up for training or certification. The majority of the remainder goes to the Georgia Forestry Commission, whose flights for the midstate region – call sign “Smokey” – originate at Macon Downtown. For the first time in several years, they can now fuel up at their home airport, and the proceeds from those fuel sales will help fund MGA’s aviation programs in Macon. Another MGA-liveried Piper approaches the far end of the runway, and everyone pauses what they’re doing long enough to watch it touch down, slow, and taxi towards the ramp. Fischer continues, rattling off a short but distinguished list of state VIP’s who have landed at the airport since MGA began FBO operations, including Governor Nathan Deal. “It can handle just about any corporate plane, up to a King Air or a Cessna Citation XL,” says Fischer of the airport’s 4,600-foot runway. Apparently Macon’s location, location, and location are a draw for many aviators – the Macon programs are already at full enrollment and the Macon-based fleet is already growing. Flight in Macon will soon be adding its first multi-engine aircraft, and FBO Manager Larry Dees is in the middle of refurbishing a Cessna 182 that will allow the University add high-performance ratings to its offerings. But Macon is not the only waypoint on the University’s Aviation expansion map – as Georgia’s only public four-year School of Aviation, MGA’s reach is spreading beyond its home turf in the midstate. Flight programs similar to the one in Macon will soon be offered in Valdosta, Columbus, Savannah, and Camden County, and additional aircraft and training facilities are in the works for the Aviation hub in Eastman. As aviation becomes increasingly important to Georgia’s economy, the industry’s need for top-flight aviators increases. And as Georgians across the state look to find their life’s work above the clouds, there will be one of MGA’s purple-and-white Pipers – call sign “MidKnight” – close to home to help them get there. Photo: "MidKnight 138 is cleared for takeoff." - At the end of Macon Downtown Airport's 4600' runway, CFI student Alex Shakkour controls the plane from the right-hand seat while MGA Chief Flight Instructor Chad Fischer observes and evaluates from the left-hand seat. This article originally appeared in the fall 2016 issue of MGA Today magazine.